1) This paper is based on the keynote presentation that Prof. Stig Enemark, FIG President gave at the FIG Working Week in Eilat, Israel, 3-8 May 2009. Key words: surveyors, land governance, Millennium Development Goals, spatially enabled government. “Do surveyors have a role to play in the global agenda?” - from a FIG point of view the answer to this question is clearly a “Yes”! Simply, no development will take place without having a spatial dimension, and no development will happen without the footprint of surveyors – the land professionals. There is a big swing that could be named “From Measurement to Management”. This paper presents the changing role of the surveyors and their commitment to the global agenda in terms of sound Land Governance in support of the Millennium Development Goals. The eight Millennium Development Goals (MDGs) form a blueprint agreed to by all the world’s countries and the world’s leading development institutions. The first seven goals are mutually reinforcing and are directed at reducing poverty in all its forms. The last goal - global partnership for development - is about the means to achieve the first seven. These goals are now placed at the heart of the global agenda. To track the progress in achieving the MDGs a framework of targets and indicators is developed. This framework includes 18 targets and 48 indicators enabling the ongoing monitoring of the progress that is reported on annually (UN, 2000). “Do surveyors have a role to play in the global agenda?” - from a FIG point of view the answer to this question is clearly a “Yes”! The surveyors play a key role in supporting an efficient land market and also effective land-use management. These functions underpin development and innovation and form a kind of “backbone” in society that supports social justice, economic growth, and environmental sustainability. Simply, no development will take place without having a spatial dimension, and no development will happen without the footprint of surveyors – the land professionals. In a global perspective the areas of surveying and land administration are basically about people, politics, and places. It is about people in terms human rights, engagement and dignity; it is about politics in terms of land policies and good government; and it is about places in terms of shelter, land and natural resources. Contributing to the Global agenda is about “flying high”. But the idea is also to better understand the very key role that the surveying profession play in underpinning sustainable development at national and local level. This is about the daily work of the surveyors in meeting the needs of the clients – it is about “keeping the feet on the ground”. In facing the global agenda the role of FIG – the global surveying community - is threefold: (i) to explain the role of the surveying profession and the surveying disciplines in terms of their contribution to the MDGs. Such statements should also make the importance of the surveying profession disciplines better understood in a wider political context; (ii) to develop and disseminate knowledge, policies and methods towards achieving and implementing the MDGs - a number of FIG publications have already made significant contributions in this regard; and (iii) to work closely with the UN agencies and the World Bank in contributing to the implementation of the MDGs. An outcome of these efforts relates to cooperation with UN-Habitat in developing a model for providing secure social tenure for the poorest (Augustinus et.al. 2006). Another outcome is the recent joint FIG/World Bank conference held in March 2009 focusing on “Land Governance in Support of the MDGs – Facing the New Challenges”, see http://www.fig.net/news/news_2009/fig_wb_march_2009.htm. “Is the role of the surveyors changing?” – in a global perspective the answer will be “Yes”! There is a big swing that could be entitled “From Measurement to Management”. This does not imply that measurement is no longer a relevant discipline to surveying. The change is mainly in response to technology development. Collection of data is now easier, while assessment, interpretation and management of data still require highly skilled professionals. The role is changing into managing the measurements. There is wisdom in the saying that “All good coordination begins with good coordinates” and the surveyors are the key providers. In the more technical and natural science area of surveying this move can be illustrated by the evolution from the concept of Geodetic Datums to Positioning Infrastructures. A geodetic datum is a (multi level) geodetic reference framework describing positions in three dimensions. It supports the traditional functions of surveying and mapping and underpins all of what we now call geo-spatial information. The concept of a Positioning Infrastructure is based on Global Navigation Satellite Systems (GNSS) such as GPS and extends to the ground infrastructure used to improve the accuracy and reliability of GNSS positioning for users. It widens the functions to enable the monitoring of global processes such as those associated with climate change and disaster risk management and also real time positioning for e.g. agricultural farming purposes (Higgins, 2009). The concept of a modern Positioning Infrastructure (combining satellites and reference stations on the ground) still supports the activities traditionally associated with a geodetic datum but extends toward much broader roles on the global scale. It can be argued that GNSS could be considered one of the only true global infrastructures in that the base level of quality and accessibility is constant across the globe. Such a Positioning Infrastructure moves the focus from measurement of framework points to management of the data received from the positioning system. The change from measurement to management also means that surveyors increasingly contribute to building sustainable societies as experts in managing land and properties. As mentioned above, the surveyors play a key role in supporting an efficient land market and also effective land-use management that underpin development and innovation for social justice, economic growth, and environmental sustainability. Arguably sound land governance is the key to achieve sustainable development and to support the global agenda set by adoption of the Millennium Development Goals (MDGs). Land governance is about the policies, processes and institutions by which land, property and natural resources are managed. This includes decisions on access to land, land rights, land use, and land development. Land governance is basically about determining and implementing sustainable land policies. Such a global perspective for Land Governance or Land Management is shown in figure 2. Figure 2. A Global Land Management Perspective (Enemark, 2004). Land governance and management covers all activities associated with the management of land and natural resources that are required to fulfil political and social objectives and achieve sustainable development. Land management requires inter-disciplinary skills that include technical, natural, and social sciences. The operational component of the land management concept is the range of land administration functions that include the areas of land tenure (securing and transferring rights in land and natural resources); land value (valuation and taxation of land and properties); land use (planning and control of the use of land and natural resources); and land development (implementing utilities, infrastructure, construction planning, and schemes for renewal and change of existing land use). Land administration systems (LAS) are the basis for conceptualizing rights, restrictions and responsibilities. Property rights are normally concerned with ownership and tenure whereas restrictions usually control use and activities on land. Responsibilities relate more to a social, ethical commitment or attitude to environmental sustainability and good husbandry. In more generic terms, land administration is about managing the relations between people, policies and places in support of sustainability and the global agenda set by the MDGs. In the Western cultures it would be hard to imagine a society without having property rights as a basic driver for development and economic growth. Property is not only an economic asset. Secure property rights provide a sense of identity and belonging that goes far beyond and underpins the values of democracy and human freedom. Historically, however, land rights evolved to give incentives for maintaining soil fertility, making land-related investments, and managing natural resources sustainably. Therefore, property rights are normally managed well in modern economies. The main rights are ownership and long term leasehold. These rights are typically managed through the cadastral/land registration systems developed over centuries. Other rights such as easements and mortgage are often included in the registration systems. The formalized western land registration systems are basically concerned with identification of legal rights in support of an efficient land market, while the systems do not adequately address the more informal and indigenous rights to land that is found especially in developing countries where tenures are predominantly social rather than legal. Therefore, traditional cadastral systems can not adequately supply security of tenure to the vast majority of the low income groups and/or deal quickly enough with the scale of urban problems. A new and innovative approach is found in the continuum of land rights (including perceived tenure, customary, occupancy, adverse possession, group tenure, leases, freehold) where the range of possible forms of tenure is considered as a continuum from informal towards more formal land rights and where each step in the process of securing the tenure can be formalised (UN-Habitat, 2008). Land-use planning and restrictions are becoming increasingly important as a means to ensure effective management of land-use, provide infrastructure and services, protect and improve the urban and rural environment, prevent pollution, and pursue sustainable development. Planning and regulation of land activities cross-cut tenures and the land rights they support. How these intersect is best explained by describing two conflicting points of view – the free market approach and the central planning approach. The free market approach argues that land owners should be obligated to no one and should have complete domain over their land. In this extreme position, the government opportunity to take land (eminent domain), or restrict its use (by planning systems), or even regulate how it is used (building controls) should be non-existent or highly limited. The central planning approach argues that the role of a democratic government includes planning and regulating land systematically for public good purposes. Regulated planning is theoretically separated from taking private land with compensation and using it for public purposes. In these jurisdictions the historical assumption that a land owner could do anything than was not expressly forbidden by planning regulations changed into the different principle that land owners could do only what was expressly allowed, everything else being forbidden. The tension between these two points of view is especially felt by nations seeking economic security. The question however is how to balance owners’ rights with the necessity and capacity of the government to regulate land use and development for the best of the society. The answer to this is found in a country’s land policy which should set a reasonable balance between the ability of land owners to manage their land and the ability of the government to provide services and regulate growth for sustainable development. This balance is a basis for achieving sustainability and attaining the MDGs. Informal development may occur in various forms such as squatting where vacant state-owned or private land is occupied and used illegally for housing or any construction works without having formal permission from the planning or building authorities. Such illegal development could be significantly reduced through government interventions supported by the citizens. Underpinning this intervention is the concept of integrated land-use management as a fundamental means to support sustainable development, and at the same time, prevent and legalise informal development (Enemark and McLaren, 2008). Property responsibilities are culturally based and relate to a more social, ethical commitment or attitude to environmental sustainability and good husbandry. Individuals and other actors are supposed to treat land and property in a way that conform to cultural traditions and ways of good ethical behaviour. This relates to what is accepted both legally and socially. Therefore, the systems for managing the use of land vary throughout the world according to historical development and cultural traditions. More generally, the human kind to land relationship is to some extent determined by the cultural and administrative development of the country or jurisdiction. Social responsibilities of land owners have a long heritage in Europe. In Germany, for example, the Constitution is insisting on the land owner’s social role. In general, Europe is taking a comprehensive and holistic approach to land management by building integrated information and administration systems. Other regions in the world such as Australia creates separate commodities out of land, using the concept of “unbundling land rights”, and is then adapting the land administration systems to accommodate this trading of rights without any national approach. Land management underpins distribution and management of a key asset of any society namely its land. For western democracies, with their highly geared economies, land management is a key activity of both government and the private sector. Land management, and especially the central land administration component, aim to deliver efficient land markets and effective management of the use of land in support of economic, social, and environmental sustainability. 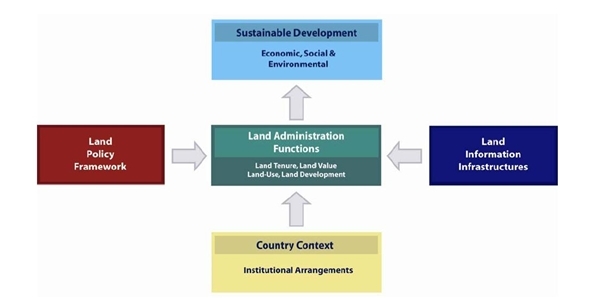 The land management paradigm as illustration in figure 3 below allows everyone to understand the role of the land administration functions (land tenure, land value, land use, and land development) and how land administration institutions relate to the historical circumstances of a country and its policy decisions. Importantly, the paradigm provides a framework to facilitate the processes of integrating new needs into traditionally organised systems without disturbing the fundamental security these systems provide. The response to change pressures in any particular jurisdiction will depend on how local leaders understand the vision. 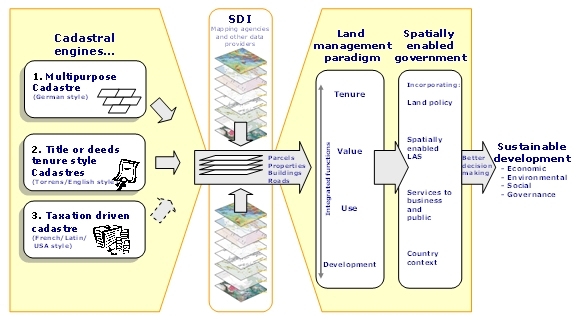 While the larger theoretical framework described above is futuristic for many countries, they must still design their land administration systems around the land management paradigm. 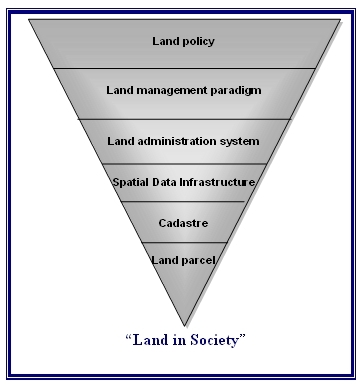 A simple entry point showing how to do this uses a hierarchy of land issues in figure 4 showing how the concepts involved in the paradigm fit together in a hierarchical manner ranging from land policies to the land parcel. Land policy determines values, objectives and the legal regulatory framework for management of a society’s major asset, its land. The land management paradigm applies to LAS design to drive an holistic approach to the LAS, and forces its processes to contribute to sustainable development. The paradigm allows LAS to assist land management generally. Land management activities include the core land administration functions: land tenure, value, use and development, and encompass all activities associated with the management of land and natural resources that are required to achieve sustainable development. The land administration system provides the infrastructure for implementation of land policies and land management strategies, and underpins the operation of efficient land markets and effective land use management. The cadastre is at the core of any LAS. The spatial data infrastructure provides access to and interoperability of the cadastral information and other land information. The cadastre provides the spatial integrity and unique identification of every land parcel usually through a cadastral map updated by cadastral surveys. The parcel identification provides the link for securing rights in land, controlling the use of land and connecting the ways people use their land with their understanding of land. The land parcel is the foundation of the hierarchy because it reflects the way people use land in their daily lives. It is the key object for identification of land rights and administration of restrictions and responsibilities in the use of land. The land parcel links the system with the people. The hierarchy illustrates the complexity of organizing policies, institutions, processes, and information for dealing with land in society. But it also illustrates an orderly approach represented by the six levels. This conceptual understanding provides the overall guidance for building LAS in any society, no matter the level of development. The hierarchy also provides guidance for adjustment or reengineering of existing LAS. This process of adjustment should be based on constant monitoring of the results of the land administration and land management activities. The land policies may then be revised and adapted to meet the changing needs in society. The change of land policies will require adjustment of the LAS processes and practices that, in turn, will affect the way land parcels are held, assessed, used, or developed. New distribution concepts such as Google Earth provide user friendly information in a very accessible way. We should consider the option where spatial data from such concepts are merged with built and natural environment data. This unleashes the power of both technologies in relation to emergency response, taxation assessment, environmental monitoring and conservation, economic planning and assessment, social services planning, infrastructure planning, etc. This also include designing and implementing a suitable service oriented IT-architecture for organising spatial information that can improve the communication between administrative systems and also establish more reliable data based on the use of the original data instead of copies. Spatial enablement offers opportunities for visualisation, scalability, and user functionalities. This is related to institutional challenges with a range of stakeholder interests. This includes Ministries/Departments such as: Justice; Taxation; Planning; Environment; Transport; Agriculture; Housing; Regional and Local Authorities; Utilities; and civil society interests such as businesses and citizens. Creating awareness of the benefits of developing a shared platform for Integrated Land Information Management takes time. The Mapping/Cadastral Agencies have a key role to play in this regard. The technical core of Spatially Enabling Government is the spatially enabled cadastre. The land management paradigm makes a national cadastre the engine of the entire LAS, underpinning the country’s capacity to deliver sustainable development. The role of the cadastre as the engine of LAS is neutral in terms of the historical development of any national system, though systems based on the German and Torrens approaches, are much more easily focused on land management than systems based on the French/Latin approach. The cadastre as an engine of LAS is shown diagrammatically in figure 5. The diagram highlights the usefulness of the large scale cadastral map as a tool by exposing its power as the representation of the human scale of land use and how people are connected to their land. The digital cadastral representation of the human scale of the built environment, and the cognitive understanding of land use patterns in peoples’ farms, businesses, homes, and other developments, then form the core information sets that enable a country to build an overall administrative framework to deliver sustainable development. Sustainable and locally responsive: It balances the economic, social, and environmental needs of present and future generations, and locates its service provision at the closest level to citizens. Legitimate and equitable: It has been endorsed by society through democratic processes and deals fairly and impartially with individuals and groups providing non-discriminatory access to services. Transparent, accountable and predictable: It is open and demonstrates stewardship by responding to questioning and providing decisions in accordance with rules and regulations. Participatory and providing security and stability: It enables citizens to participate in government and provides security of livelihoods, freedom from crime and intolerance. Dedicated to integrity: Officials perform their duties without bribe and give independent advice and judgements, and respects confidentiality. There is a clear separation between private interests of officials and politicians and the affairs of government. Once the adjective “good” is added, a normative debate begins. In short: sustainable development is not attainable without sound land administration or, more broadly, sound land management. The key challenges of the new millennium are clearly listed already. They relate to climate change; food shortage; energy scarcity; urban growth; environmental degradation; and natural disasters. These issues all relate to governance and management of land. Land governance is a cross cutting activity that will confront all traditional “silo-organised” land administration systems. Land governance and management is going to be a core area for the surveyors – the land professionals. This area requires high level geodesy to create the models that can predict future changes; modern surveying and mapping tools that can control implementation of new physical infrastructure and also provide the basis for the building of National spatial data infrastructures; and finally sustainable land administration systems that can manage the core functions of land tenure, land value, land use, and land development. FIG (the International Federation of Surveyors) intend to play a strong role in building the capacity to design, build and manage national surveying and land administration systems that facilitates sustainable Land Governance in support of the MDGs. In short, FIG is aiming at “Building the capacity for taking the land policy agenda forward”. The MDGs represent a wider concept or a vision for the future, where the contribution of the land professionals is central and vital. FIG, being a global NGO representing the surveying community/land professionals in more than 100 countries throughout the world, is strongly committed to the global agenda as presented in the MDGs. The surveyors – nationally and globally – will have a key role as providers of the relevant spatial information and also as builders of efficient land tenure systems and effective measures for urban and rural land use management. The role of FIG is about “Building the Capacity” in this area. Issues such as tenure security, pro-poor land management, and good governance in land administration are all key issues to be advocated in the process of contributing to the global agenda. Measures such as capacity assessment, institutional development and human resource development are all key tools in this regard. More generally, the work of the land professionals within land management forms a kind of “backbone” in society that supports social justice, economic growth, and environmental sustainability. These aspects are all key components in facing the global agenda. Augustinus, C., Lemmen, C.H.J. and van Oosterom, P.J.M. (2006) Social tenure domain model requirements from the perspective of pro - poor land management. Proceeding of the 5th FIG regional conference, 8-11 March 2006, Accra, Ghana. Enemark, S. and McLaren, R. (2008): Preventing Informal Development – through Means of Sustainable Land Use Control. Proceedings of FIG Working Week, Stockholm, 14-19 June 2008. Higgins, M. (2009): Positioning Infrastructures for sustainable Land Governance. Proceedings of FIG/WB Conference on Land Governance in Support of the MDGs, Washington, 9-10 March 2009. Williamson, Enemark, Wallace, Rajabifard (2009): Land Administration Systems for Sustainable Development. ESRI Press. In press. Stig Enemark is President of the International Federation of Surveyors, FIG 2007-2010. He is Professor in Land Management and Problem Based Learning at Aalborg University, Denmark, where he was Head of School of Surveying and Planning 1991-2005. He was President of the Danish Association of Chartered Surveyors (DdL) 2002- 2006 and he is an Honorary Member of DdL. He is a well known international expert in the areas of land administration systems, land management and spatial planning, and related educational and capacity building issues. He has published widely in these areas and undertaken consultancies for the World Bank and the European Union especially in Eastern Europe, Sub Saharan Africa.